Microsoft's free Security Essentials may well put pressure on other commercial anti-virus software companies, but it is more important to protect people's PCs according to the company's UK head of security Cliff Evans. The arrival of free security software from perhaps the biggest name in software obviously brings with it major bonuses for the consumer, but with Security Essentials available for nothing some company's that provide alternatives are going to feel the pinch. 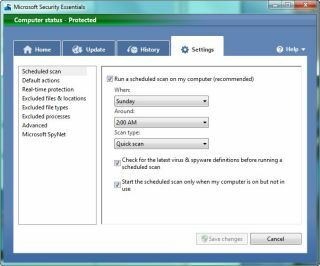 In a conversation with TechRadar, Evans admitted that the arrival of Microsoft Security Essentials raised interesting questions, but insisted that the company was more interested in offering the best possible protection for the majority. "Consumers could uninstall their other anti-virus software, install Security Essentials and know that they are going to get a high-quality, free, excellent anti-malware product," said Evans. "Does it cover every aspect of security on the PC? No, but no product does. "The best approach is a multi-layered one where updates are switched on and people have the latest browsers and if you do all these kind of things then you can make sure you have a trusted machine." Evans believes that getting the majority of people on regularly updated anti-malware software on their PCs is hugely important in the modern connected world. "Our primary purpose is making sure that as many people as possible have an anti-malware product and at the moment there are barriers to that. "People are confused by the options, they don't like paying on the credit card online for the latest software – there are lots of things like that. "We're trying to address that with a lightweight pure anti-malware product that can be installed on a less powerful machine. "It's available in 19 countries today with more to follow this year and next." Some anti-malware packages have a reputation for being resource-greedy and too overt in their attempts to get people to upgrade, but Microsoft has tried to take a different path. "Something we've focused on enormously is the idea that this is an install and forget program," adds Evans. "It will sit there quietly, update without any fuss, and its integrated with all the right technologies. "We've focused on making sure it doesn't take up too much memory, as that has been one of the problems with the anti-malware experience."